Caribbean Spiced Rum Chicken Thighs, glazed with a barbecue sauce that is flavored with Captain Morgan’s Spiced Rum and pineapple juice and then grilled, will have you dreaming of a trip to the islands. Honey and pineapple juice give the chicken sweetness, sriracha gives heat and the spiced rum, fresh ginger and five spice seasoning add lots of aromatic flavors to the barbecue sauce. When cooked on the grill, the rum glaze caramelizes as it cooks, adding lots of lip smacking good flavor to the tender juicy chicken. 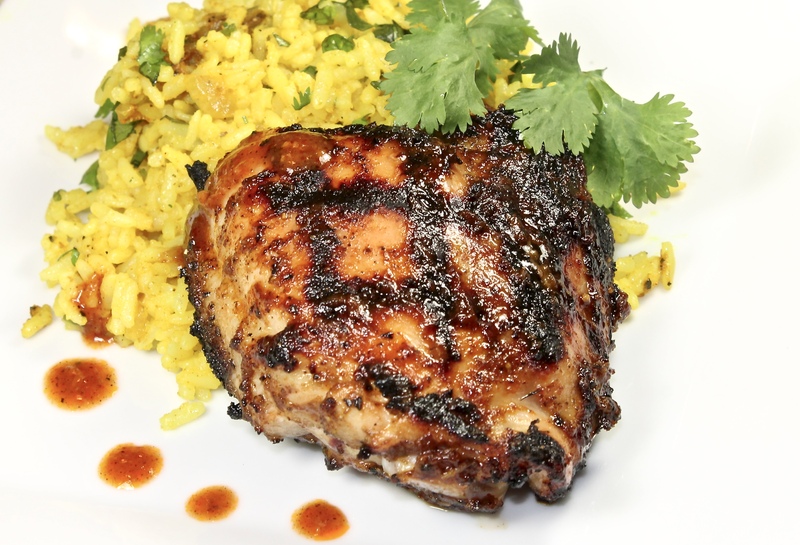 I served the spiced rum chicken thighs, which were drizzled with a little extra sauce, alongside curried rice. The rice, seasoned with browned onions, curry powder, turmeric and fresh cilantro, complemented the flavorful chicken and added color to the plate. Melt the butter in a small sauce pan and add the garlic and ginger. Cook for about 30 seconds and then add all the other sauce ingredients. Simmer for a few minutes until the sauce comes together. If the sauce appears too thick, you can thin with a little water. Set aside to cool. If the sauce separates after cooling, whisk before using. Season the chicken thighs generously with salt, pepper, garlic powder and onion powder. Spoon some of the cooled sauce over both sides of the chicken, cover and refrigerate for a minimum of 30 minutes but longer is better. Take the chicken out of the refrigerator 30 minutes before you are ready to grill. Reserve the remainder of the sauce. It can either be used to brush on the cooked chicken or poured into a bowl and passed around at the table. Preheat your grill for 15 to 20 minutes until hot. (One zone on med. high and one medium.) Arrange the chicken skinned (presentation) side down on the high heat zone. Depending on how hot your grill is, cook for about 3 minutes with the lid down and then rotate the thighs 90 degrees to get crosshatch marks and cook for another 3 minutes. Turn the chicken thighs over and cook the same way for another 4 to 6 minutes until done and the juices run clear. If the sauce appears to be getting too dark, move to the cooler cooking zone. When the thighs are done, remove from the grill and let rest a couple of minutes so that the juices redistribute. *The trick to good grill marks is to turn the meat as little as possible. When done remove from the grill. 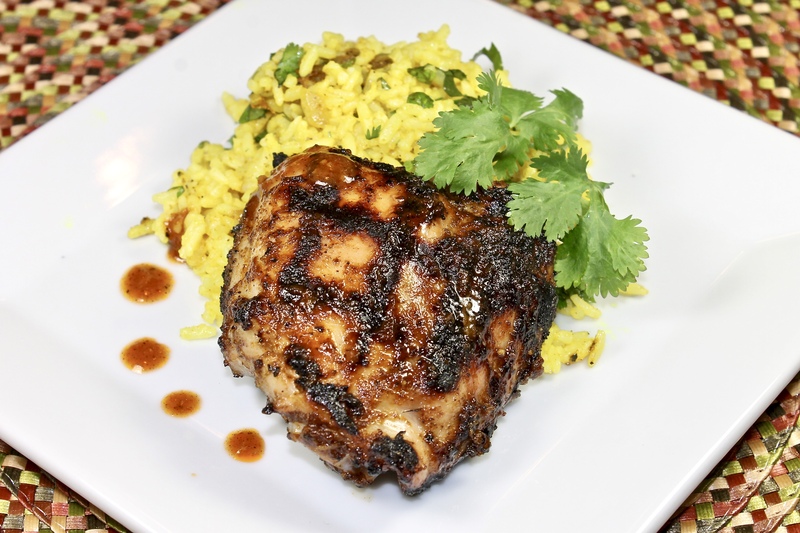 I hope you will try and enjoy my island inspired Caribbean spiced rum chicken the next time you grill. If you are having friends over, you might want to cook other parts of the chicken as well as the thighs, just adjust the cooking time and double or triple the sauce. The barbecue sauce is easily adapted to your own tastes. I used Captain Morgan’s Spiced Rum because that is my husband’s favorite and we alway have it in our home. If you don’t have it, use any spiced rum or dark rum that you have on hand. The sauce is moderately spicy from the use of sriracha. While not nearly as spicy as the well known jerk marinade that is used in Jamaica, you can adjust the heat with whichever hot sauce that you like. Want it sweeter, add more honey. However you decide to make it, I believe you will enjoy Caribbean spiced rum chicken…it is lip smacking good. This entry was posted in food, Home, lifestyle, photography, recipes and tagged Captain Morgan Spiced Rum, caribbean rum chicken, Caribbean spiced rum chicken thighs, rum barbecue sauce, spiced rum chicken recipe, spicy rum and pineapple glaze. Bookmark the permalink. Looks delicious. Hate to repeat myself, but I hope your family appreciates your cooking skills. These sound absolutely delicious and perfect for a bbq! I’m just planning my menu for the week and this will be on it. Man does this sound delicious. And the rice side dish = perfect. You nailed this Karen. Definitely takes me back to the Islands. Looks delicious. I love a good island chicken meal and this one fills the bill! YUM! I think thes thighs are the best use of Captain Morgan I have seen! I can’t quite tell from the photos – did you use skinless (and boneless) chicken thighs? very inspired. I bet they were DEEElicious. I love a chicken thigh mm and love the rice too. That looks so summery and delicious. I can tell that chicken is really juicy and tender. YUMMY! Perfect barbecue food – I bet it’s warm in Florida now. We really enjoy grilled chicken — so much flavor. And one of the neat things about it is chicken takes so well to any additional flavors you may want to add to the mix. This looks terrific — nice bold flavors, and perfect with chicken thighs (which are the best cut of the chicken to stand up to bold flavors, IMO). Very nice — thanks. Sounds lovely! I have a bottle of Captain Morgans on the shelf that needs a recipe and yours sounds to be just the trick. And, I also think the thigh of the chicken is the prime cut. This is right up my alley. I love using Capt Morgan spiced rum in my marinades. I’ll be trying this recipe this week and will let you know what we think – thank you! Looks really good Karen and I can feel the Caribbean. I love chicken thighs! I find that I’m picking them up more often than chicken breast these days….so much more flavor! I love this flavor profile! Thanks, Karen. One of these days soon, I shall try it! Great combination of flavors! The chicken thighs look amazing. Sounds delicious … and a great excuse to buy some rum. I haven’t had any in the house in ages. looks wonderful and delicious !! hugs! This recipe just screams summer! What a fabulous way to enjoy chicken. oh! those sound and look delicious! A great meal for a hot day. I love the combination of your spices. My favorite chicken part in a delectable sauce! Would love to try this soon, Karen. Thanks! Wow, this sounds delicious! I’m pinning it for future reference! Look at all that flavor! The rum, the sriracha, and then the five spice which I was surprised to see. I don’t use it much if at all, so I like seeing how you’ve used it with this chicken sauce. Looks delicious! Delightful! And the Pacific ‘Pond’ causes but few ‘disturbances’ 🙂 ! The rum and chilli sauce and ‘catsup’ may be different but the tastiness of the dish cannot be denied . . . well, I may like a little more garlic . . .
Look at that color! I am drooling in front of the screen! Totally my type of meal! Karen, wow that looks delicious. That would be a great dinner this weekend. Thanks for sharing! I’m currently on the lookout for new chicken recipes, and even though I don’t like rum by itself or in drinks, this sounds like I wouldn’t mind it mixed into a barbeque glaze! I don’t use my 5-spice much either, so this would be an opportunity. I’d have to oven-grill this, though, as I don’t have a proper grill. Oh what a fun flavor combination, Karen! I’m sure this is wonderful for summer grilling. This marinade is lip smacking delicious!!! Your chicken looks so juicy and tender too. Enjoy the grilling season. MMMMM! wonderful food styling and photo =perfect drops of sauce! That looks exceptionally good! And I like Captain Morgan’s, too. And I think I might have a bottle up in the cupboard. I buy something and then forget to drink it after the initial round of cocktails! But this dish looks like a great excuse for a party! I love that you gave such great grilling instructions, too. My Pete would absolutely love this meal, especially cooked on open coals. Have a super day Karen. Phil would eat chicken every meal and he will love your recipe. Chicken will go on the grill soon! The addition of rum is brilliant Karen – I’ve been working on a pineapple BBQ sauce but now I need to try yours 😉 Thank you for the inspiration! This looks great! My husband loves spiced rum with oj. It’s a terrible color, but he loves it. Anyway, I love the rum and Asian ingredients in this – fabulous! It’s time for us to have an island chicken meal! Thanks for inspiring! Sounds like a delightful, spicy little tropical escape you can enjoy right from the comfort of your own home! I’ll have to try this marinade on tempeh very soon. I used to always prefer breast meat and now I go for the thighs – so much more flavour and easier to cook with. These look delicious, Karen! Perfectly cooked and that spice mix sounds lovely! Genius to add Morgan’s Rum – to tenderize and add that signature flavor! And these look SO juicy!! We’re all about thighs in this house – can’t wait to try these! I can’t wait to make this, Karen! Thanks for sharing! Oh my gosh, Karen, I can just smell that wonderful aroma of Caribbean chicken. This brings back so many delicious memories of St. Thomas and the Turks and Caicos! Walking the streets with the unique smells was intoxicating. So few bloggers post recipes from the Caribbean and it has the most amazing foods! I’ll have to make this very soon! Thank you for sharing! Your post is perfectly timed because it is Carribana in Toronto! What a lovely summer dish, the BBQ sauce sounds very tasty and I’m loving the curried rice with turmeric. Thanks Karen. This looks amazing and I am definitely dreaming of a Caribbean vacation just looking at it! This glaze sounds fantastic! We love rum for cocktails and make these quite often, but I’ve never thought of using it in a chicken glaze! What a clever idea! Together with pineapple and sriracha, I can imagine how delicious this chicken thigh must be. I love the sound of this glaze. And now it gives me an excuse to go buy spiced rum! Oh my, these sound and look amazing – I love the rum! Sweet glazes are not generally my thing, but that dash of rum has me intrigued… ! I love the flavors in this! We use Captain Morgans in spiced winter drinks all the time! Oh, the combination of the sriracha with the rum sounds great- Captain Morgan, here I come!! You got some great grill marks on your chicken! Oh these look so good. Such a great idea for the BBQ, I have to try these. I made your delicious dish! It was something special to me! all those yummy flavours beautifully combined! Karen, I know how I’m preparing chicken next time we grill! This Caribbean spiced rum chicken looks absolutely divine! They were delish Karen! Need to make them again soon. Wow! Chicken thighs and rum, it sounds like a great combination. I would love to try this and I think I would make my husband very happy with this meal, he loves rum.